Although I'm an avid backpacker, with over 150 nights out in the past five years, I've only spent a dozen or so nights in national parks. 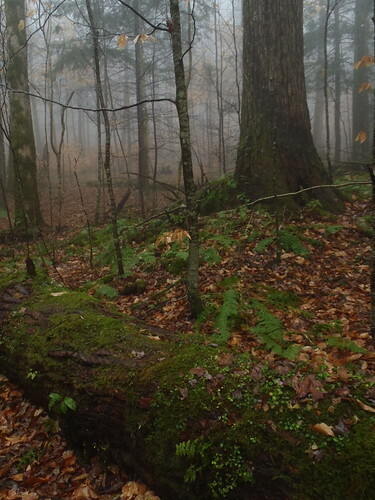 Part of that is due to proximity (I lived within an hour drive of the Daniel Boone National Forest for several years) and part of that is policy. The limited regulations regarding backpacking in national forests fit my backpacking "style" more than the designated sites of national parks; there is something about having to hike [i]x[/i]-amount of miles per day to reach a campsite that is just a bit too structured for the carefree wandering that I often prefer to do when I head out on a backpacking trip. 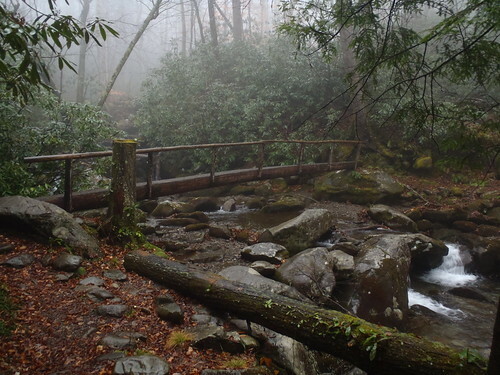 That said, I understand the recreation management philosophy of national parks and don't want to turn this trip report into a debate about those issues (especially given that Great Smoky Mountains National Park is now charging a fee for backcountry camping), but just thought it was worth mentioning. 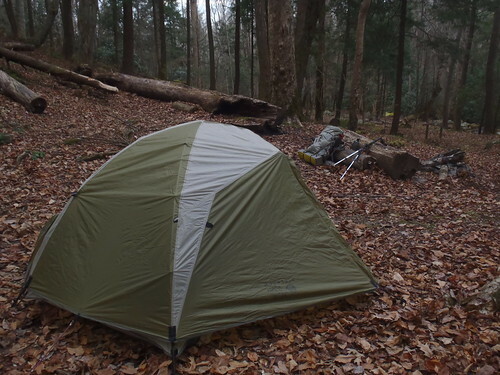 Anyways, after an outstanding three-night trip in the Joyce Kilmer-Slickrock Wilderness and a one-night layover at a friend's house in Gatlinburg, my backpacking companion John and I headed to Great Smoky Mountains National Park for another three-night trip. The logistics of this trip were quite the change from our previous trip, where I'd been familiar with the route and options for camping, and wasn't required to inform the Forest Service about our plans. On this trip, we'd be hiking trails new to both of us and had to confirm our route and campsite itinerary with the Park Service. Upon contacting the Park Service to receive confirmation and a backcountry permit for our route (leave from Cosby Campground, Gabes Mountain Trail to Campsite #34, Maddron Bald Trail to Campsite #29, Snake Den Ridge Trail to the Appalachian Trail to Cosby Shelter, then Low Gap Trail back to Cosby Campground) we were informed that Cosby Shelter was closed due to bear activity (they'd closed it a few days prior; I'd checked online about closures prior to our Joyce Kilmer-Slickrock Wilderness trip but hadn't had a chance to check again) and our option was to lose 1,700 feet of elevation and hike 2.5 miles out of our way to Campsite #37. I suppose "out of our way" is a somewhat odd remark to make when hiking in a place as beautiful as the Smokies, but it did throw a bit of kink into our agenda. 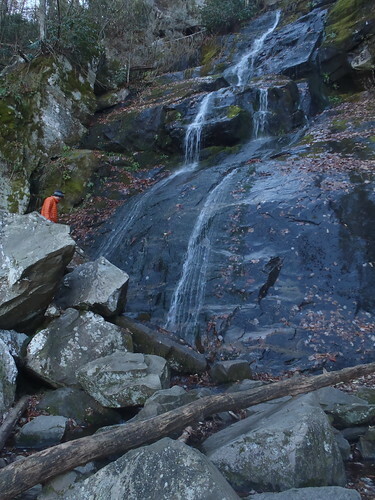 We set out from Cosby Campground on Gabes Mountain Trail with a day-hiking friend who would accompany us to Hen Wallow Falls before heading back. It was a mostly sunny day with temperatures mild enough for us to hike in t-shirts, although once we stopped moving adding insulation was necessary almost immediately. Hen Wallow Falls had a decent flow to it and made for a nice spot to break before pushing another two miles or so to Campsite #34. After arriving at Campsite #34 and setting up our tents, the clouds began to increase and looked like the chance of rain that had been forecasted was becoming more of a certainty. As day turned to dusk, an eerie fog rolled in and the wind picked up a bit. We set up a small sil-nylon tarp (original MSR E-Wing, for any gear nerds reading this) in an unbelievably ideal location: facing the tumbling stream that bordered the campsites, the low end of the tarp to the windward side and a slab of rock that made a perfect backrest. We tossed our closed-cell foam sleeping pads under there and stretched out to cook our dinner just a few minutes before the mist increased to a drizzle. Overnight it rained off and on, and we slept in until about 8:30 before venturing out of our tents during a brief respite from the rain. Breakfast was shared under the streamside dining fly and while sipping coffee we packed up as best we could in the light rain that would remain present nearly the entire day. 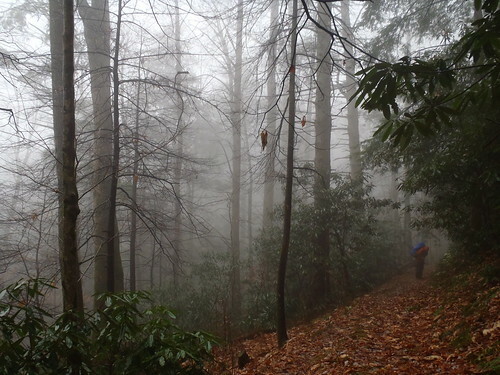 Hiking about six miles in a steady drizzle on a day where temperatures peaked in the mid-40s (according to unscientific observation of a keyring thermometer) wasn't the dreary forced-march that most non-backpackers imagined when I recounted this part of the trip. I'm a firm believer in the wisdom of the Scandinavian proverb that "There's no such thing as bad weather, only bad clothing" and this day was evidence in action. Neither of us were uncomfortable, so rather than being annoyed by the weather conditions we were able to appreciate the ethereal and enchanting ambience they created. 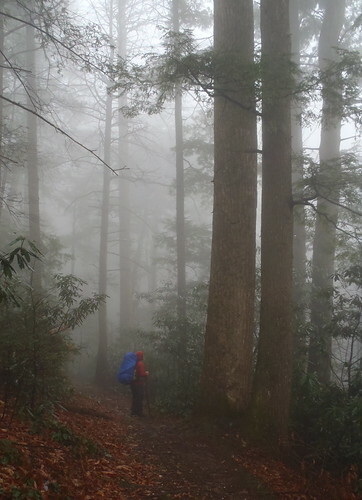 Entering Albright Grove, one of the most renowned stands of old-growth in the Smokies, in a dense fog and mist was a pleasure that was nearly overwhelming. I don't think I've ever walked so slow and in such reverence on any of my other backpacking trips. The fog created a sense of intensity and mystery that was absolutely magical. 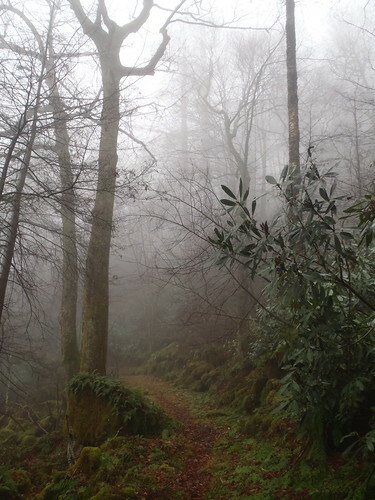 Each massive bole appeared seemingly out of thin air and was then charmingly silhouetted against a backdrop of fog. After a leisurely and surreal hike through Albright Grove we continued on the Maddron Bald Trail to Campsite #29. The narrow trail after Albright Grove was perhaps the most enjoyable section of the day. The innumerable permutations on the theme of green present in the mosses, ferns, rhododendrons, and the needles of hemlocks, pines and spruces, appeared even more vibrant in the fog-filtered light; there was a richness in the carpet of fallen foliage that almost glowed. Arriving at Campsite #29, where like the previous night we were the only occupants, we proceeded to set up camp and our dining fly -- again at a pleasant streamside spot. "Cold and damp" were the two adjectives that I used to describe the evening in my journal. At 9:00 p.m. it was 35 degrees and the fog and mist were still thick. We headed to our tents shortly thereafter, eager to slide into our warm, dry sleeping bags and for the fog to lift in the morning and allow us a less obstructed view of our surroundings. Morning came clear, sunny and cold. We awoke around 8 a.m. and began to chip away at the frost and ice that had formed on our wet tents. The sun and movement of packing up, as well as coffee and oatmeal, warmed us up relatively quickly and we were packed and on the trail within perhaps an hour of waking. We were treated to several partial vistas from the Maddron Bald Trail after leaving camp and encountered several patches of trailside snow beneath spruce trees. 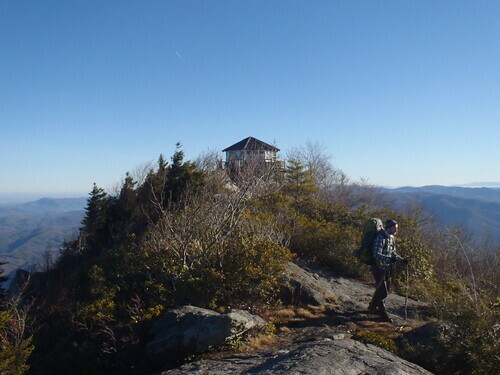 We joined Snake Den Ridge Trail and then the Appalachian Trail, which we would take to the Cosby Shelter where we would dry our gear out in the early afternoon sun and take an extended lunch break. The next day we got an incredibly early start and headed to the Mt. 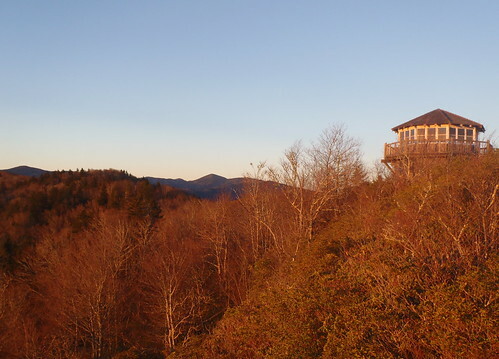 Cammerer lookout tower to enjoy the 360 degree views of the sunrise before retracing our steps on the Appalachian Trail to the junction with Low Gap Trail, which we then took back to Cosby Campground. Low Gap Trail was relatively non-remarkable. Pleasant enough, but nothing in particular really stood out. Much better than walking down the sidewalk of a shopping center, but not as aesthetically compelling as some of the other trails we had hiked. The next stop worthy of a trip report on my early winter tour of the Southeast was Cumberland Island National Seashore. I hope to post a trip report of that three-night trip in the near future.